And, I owe you readers an apology for the posts over the next month or so. I don't know how timely they will be nor can I promise a lot of substance. There will probably be some fluff and some re-posting of earlier blogs, which is okay, because those poor posts need some love. Today, I'm going to share a link to an article that I posted earlier in the year. It's a great recipe and I know you will enjoy it. I shared it on the blog At The Women's Room earlier this week. By the way, I've graciously been asked to be a contributor to that blog, so I hope you will pop over and read it sometimes. I am privileged to be joining 6 other fantastic bloggers in this endeavor! They have wonderful blogs and have written some really great articles At The Women's Room. Brenda, at Cozy Little House, put the blog together and she has done a wonderful job! While my thoughts are scattered all over the place, please bear with me, but please don't go away! I love your comments and enjoy being able to chat with you via email! 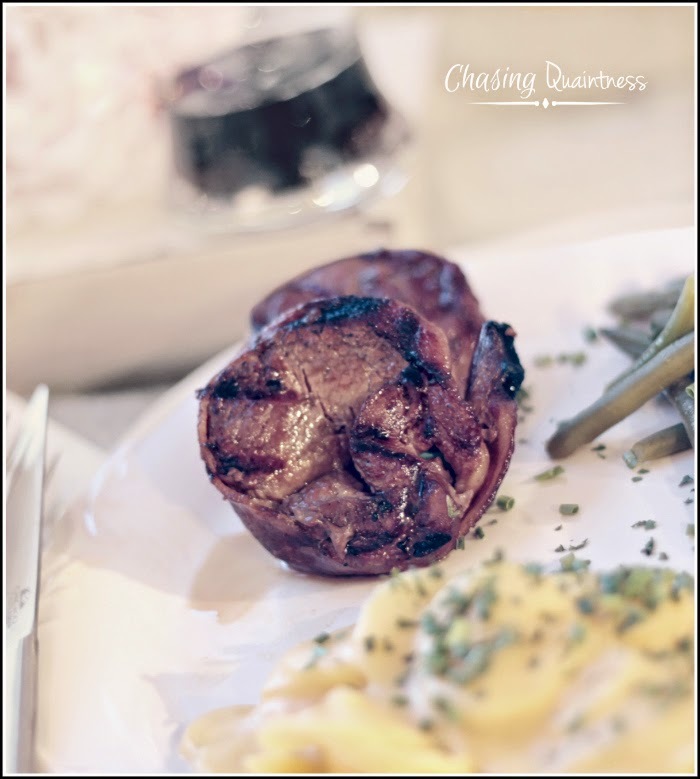 So after all of that, I'm finally sharing what I wanted to share..the recipe for Coffee-Cured Filet Mignon. I know you are thinking that it is a fancy recipe since it includes Filet Mignon, but folks, Filet Mignon is pretty darn reasonable. You can get a 2-pack at Walmart for around $8.00. This recipe was super easy and you just throw the steaks on the grill. You can click here for the original post and a printable copy of the recipe. Give it a try...you will love it! 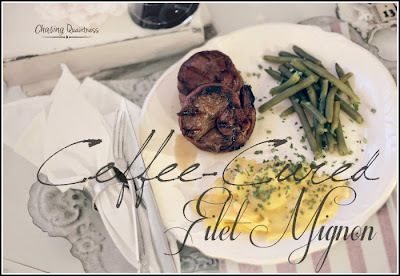 I printed it out as I love filet mignon. Don't drink coffee but love coffee rubbed burgers, coffee ice cream, etc. Hey, you know we're going to be right here with Chasing Quaintness through the move and settling in, don't you? Do what you can when you can. It's all okay. Thank you so much Dewena, you are so sweet! I can have a big moving party and you can all help me pack and unpack! :-D I'm not a coffee drinker either, but like you, love using it with burgers, pork chops and in other recipes! Thank you so much Jemma! Believe me, if you all lived closer, we would be having a big moving party!! Hugs!! Please let me know how you guys liked it. I'm curious for another opinion. Moving is such a pain and seems to drag on forever...LOL Thanks so much!! Hugs!! Could we please just have a photo or two? Pretty, pretty please? I'm not going anywhere! I want to be around for the big decorating reveal! And for all the ups and downs in between! They look even better the second time around! Thank you ma'am! I've really enjoyed talking to you this weekend and appreciate all of your help! Just so excited you will be moving into your new home soon. Hey life happens sometimes so blog breaks happen too. Post when you can we will all be here. LOL...you are too funny! The Amish meal sounds wonderful, except for the zucchini and squash...LOL. Thanks so much girlie!! Hugs!! Real life is messy and it's unpredictable and it's scattered, it's understandable that your blog would reflect that. I can't wait to see what pops up! Good luck with the house! Thank you so much! LOL…it’s about to get really messy. My house looks like a tornado went through! Already driving me crazy! Good luck with all it takes to move and unpack. We'll just wait until you feel like chatting. Remember to take breaks (and drink lots of water, although I would probably be drinking wine, but then I wouldn't remember where I put anything). Seriously just enjoy your new journey and we will love hearing about it later. You are going to be going through an amazing, thrilling, tiring, wonderful, memory-making, busy, waiting, happy-making time of your life. Worry not, about your blogging life! We will be here!!!! So happy to see how all your plans, have finally worked out. Awww, thank you so much Tessa! We are excited and weary all at the same time. We've decided to pace ourselves and come up with a packing schedule. We will see how that turns out...LOL. Hugs back to you!! How dare you go off and deal with real life! Listen lady, I expect a post every single day, no matter what's going on. And if I visit you, there had better be appetizers and that steak on my plate for dinner! LMAO....you are hilarious!!! You know what, I'm sure there is someone out there who would write that...LOL I am proud of myself though..we are having a real meal tonight...it was pizza last night! ;-) Hugs!! Just read your blog. I, too, am a cookbookaholic!! I probably have around 250 of them. I may not ever use a recipe in most of them but I still have them because I can't get rid of them. They all have a reason for me owning them. I'm right there with you...I just love them and treasure each one! Thanks so much! This looks amazing. I am pinning to try very soon. My husband will love it. Let me know what you guys think! The hubster loves it! Good luck with your move, it's stressful (I know!) and just enjoy every moment and memory of moving into your new home! Thank you so much Kimberley! It is most definitely more important, but for some reason, I can’t stay away…LOL. I enjoy reading y’alls blogs, so it will be a little bit of give and take! :-) Hopefully, the blog will help ease some of the stress! :-) Hugs!! Thank you ma’am! It’s a great recipe…the cookbook has all kinds of interesting things.